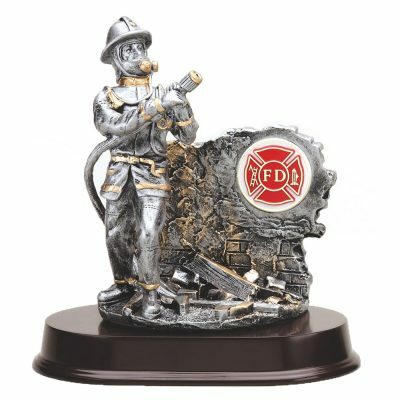 Honor a top responder of the year with this Firefighter Service Award featuring a Fireman with a Hose and Medallion Statue. This pewter-toned resin stands 9” tall and features a firefighter with a hose. The wall he stands next to has a Medallion Fire Department insert. Also has a bronze and black plate for imprinting. Ideal award for a fireman in the department as a ‘Years of Service Award’. Price is statue and name plate with lettering. A fire company logo can be inserted in the place of the standard Medallion Fire Department insert at no additional cost.